Today I'm gona show you how to retrieve the product attributes in your Magento site. Edit your attribute. Set Used in product listing to yes. In my case I want to add some of my own attributes to the product list. Just to be sure I have a variable wich contains the product. Now after the function above I can start coding. The function will only work for input text attributes. You have to capitalize your attribute name from shoes to Shoes. 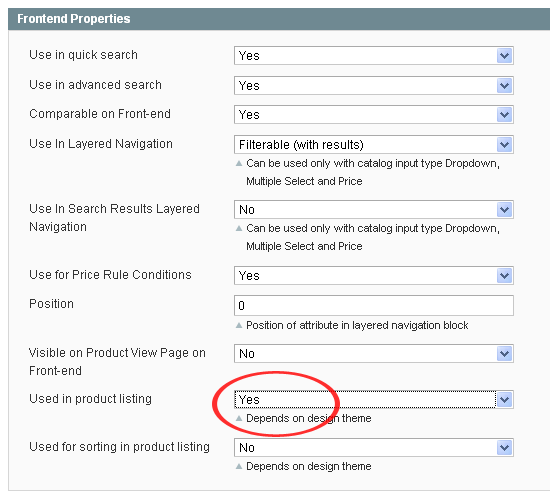 Check out How to get Dropdown Attributes Magento. Im new to Magento and stumped by attributes, in particular showing them on the product page. Do you really need to add/modify code to show them ie its not just a case of enabling them in the front end from Admin? When you go to the attribute edit page (backend) you have some options for showing it in the detail page. What I’m doing in this post is showing this attributes somewhere else (in the product list for example). Any questions you can post it here or in our Forums. Hey this is a great post thank you so much! I’m working with Magento for the first time myself and this is invaluable information. Could you make a post about say creating a list of a custom attribute in the sidebar of your site? For instance l have a custom attribute “author_name”, say l wanted to output a list of all the different “author_name”s there are in the products table. That would be a huge help! I just answered you by email. How would you name that in the getAttributeName format? I have tried everything but nothing worked, it keeps showing up as undefined. Sorry I meant PRODUCT_COLOR is the attribute code, not the label. Thank you for your reply. I have tried that before and it still would not work. hi, i try to do it in upsells.phtml but dont work, any idea? thanks a lot! Have you tried the code in an other file? To make sure it’s not the code itself. 4.789.755 post views so far. This page needed 49 queries to load.